The Flamsteed SID detection system uses a VLF receiver and a small loop antenna purchased ready-built from the United Kingdom Radio Astronomy Association (UKRAA). A detailed description of SID detection and the UKRAA VLF Receiver system can be found on their web-site: http://www.ukraa.com/www/vlf-range.html. The UKRAA website states: “The receiver has a tuning range of 12kHz to 35kHz and provides a variable output voltage of 0-2.5v and 0-5v. The output voltage may be fed to any data logger or digital multimeter or suitably equipped computer. The receiver requires a supply of 15 Volts DC at 35mA. UKRAA supplies a small loop aerial and tuning unit suitable for indoor use in moderate signal areas. Larger outdoor tuned aerials of either the loop, or “long wire” format may improve reception, and possibly reduce interference. 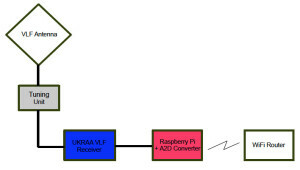 The analogue signal output from the VLF receiver is connected to an Analogue to Digital Converter (ADC) fitted to a Raspberry Pi (RPi ) model B single board computer a detailed description of which can be found at: http://en.wikipedia.org/wiki/Raspberry_Pi. The “Pi “ is powered by a 5V, 1A power adaptor and maintains a Wi-Fi connection to the internet via a Wi-Fi extender and router. The ADC is an ADC Pi V2.2, an 8 channel 17 bit analogue to digital converter designed to work with the RPi and was purchased from AE electronics. (http://www.abelectronics.co.uk/products/3/Raspberry-Pi/17/ADC-Pi-V2—Raspberry-Pi-Analogue-t o-Digital-converter ). Below is a typical Flamsteed VLF Receiver plot showing the time of sunrise and sunset line markers and two SID events. The first, a C class event occurs at 11:00 and is detected by the negative excursion on the red VLF trace. 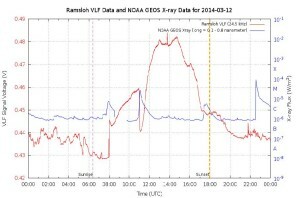 This events correlates to the increase in the X ray flux shown on the blue satellite data trace. The second, an M class event occurs at 22:30 and is detected by the satellite but not by the VLF receiver due to the fact that the sun has set and the Ionospheric D layer has dispersed. The Flamsteed VLF receiver uses the UKRAA small loop aerial and aerial tuning unit which are only suitable for indoor use, therefore the antenna is sited close to the VLF Receiver within a garden shed. Another suitable indoor location would be a loft or attic or any “electrically quiet” indoor location, free from electrical interference. The manual explains why ideally the transmitter should be between 700km and 1000km from the receiver. UKRAA suggests that initial tuning should be to a VLF station giving a strong signal. For a receiver located in the south east of England the Ramsloh Transmitter situated in Northern Germany gives a strong signal at a frequency of 24.5kHz despite being less than 700km distant. The UKRAA can supply a signal generator at this frequency to assist in tuning the receiver. A list of frequencies currently being used by SID observers can be found at: http://sidstation.loudet.org/data-en.xhtml . It is not a complete list of available signals, but may prove useful in initial tuning of the receiver and testing of the complete VLF system. The Flamsteed VLF Receiver is currently tuned to the Ramsloh transmitter. Occasionally this transmitter is switched off for maintenance and during this down time we are unable to gather SID data. To maintain coverage and possibly improve SID detection it would be desirable to monitor more than one transmitter using additional VLF receivers. The BeagleBone Black has been investigated as an alternative single board computer to the Rpi. (Details of the BeagleBone can be found at: http://beagleboard.org/Products/BeagleBone+Black.) The BeagleBone black has 7 analogue inputs (1.8V max. 12 bit A/D converters) and a faster processor than the RPi. It uses Angstrom as its operating system, another Linux distribution, and the Python VLF data gathering code developed on the Raspberry Pi has been successfully run on a BeagleBone Black. However, in testing to date it has proved to be less “robust” than the Raspberry Pi.